Greyhounds have sleek and muscular frames with a swift and sinewy look about them. They have long, narrow heads with thin muzzles, small folded ears and dark intelligent eyes. Their long, somewhat angular necks slope down to broad, deep chests with well-sprung ribs. They have powerful legs and long tails that curve slightly. Their short, neat coats can come in almost any color. 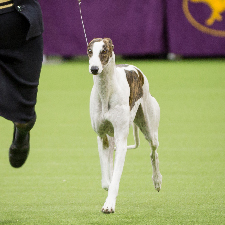 Overall, Greyhounds carry themselves gracefully. Greyhound. 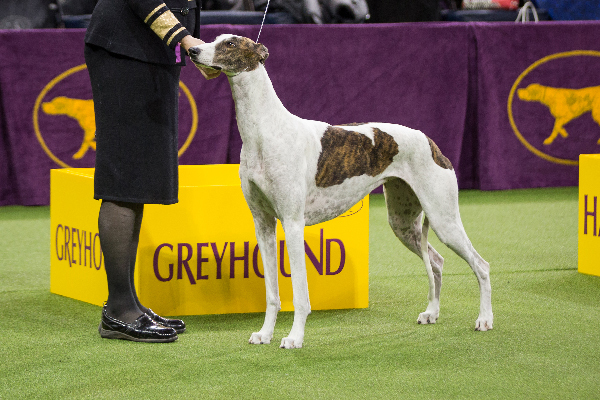 Photography by Kayla Bertagnolli, as captured at the 2018 Westminster Kennel Club Dog Show. In spite of their obvious quickness and athleticism, Greyhounds are fairly mellow. Generally, they are calm and agreeable types, happy to hang out indoors for hours. However, Greyhounds are not lazy. Rather, they have noble and reserved personalities. Greyhounds crave attention and family time. If everyone is gathering in the living room for a movie or a special occasion, these gentle and loving dogs will want to be involved. They are perfectly fine with strangers, but they are not the kind to jump up and down when someone new comes over. For this reason, they might not be the best choice for a watchdog. Greyhounds, as everyone knows, are fast. And they love to run. If you can provide them with a big back yard, that’s ideal. If not, take them on lots of walks and runs. But be sure to keep them on a leash. If Greyhound see something they want (like a squirrel, for instance) they are gone before you can blink. If you plan on being away from home for long periods of time, you should reconsider getting a Greyhound. They need attention and companionship to stay healthy and happy. If you can get a compatible dog companion for your Greyhound, that will make them very happy as well. A healthy Greyhound can live as long as 12 years. They have few genetic health issues, but they are prone to bloat: Feeding them several small meals a day—instead of one big meal—will help. Their smooth, short coat is very easy to groom. Greyhounds have been around for thousands of years, even appearing in ancient Egyptian artifacts and in the writings of the Roman poet Ovid. Beginning in the 9th century, records show English breeders developing the Greyhound into a hunter of deer, foxes and rabbits. They were brought to America in the 16th century by Spanish explorers who used them as guard dogs. Registered by the AKC in 1885, they continue to be a cherished companion in the U.S. and around the world.